These two arrays are located near each other in the City of Westby, where Vernon Electric Cooperative is located. Both were energized last week and are now generating electricity right in town. The larger of the two, owned by Colorado-based Clean Energy Collective (CEC), serves Dairyland Power Cooperative. 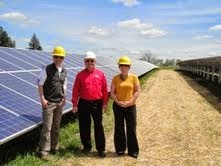 With a rated capacity of 517 kilowatts, this is the fifth largest solar electric installation in Wisconsin. The other, also owned by CEC, serves Vernon Electric Cooperative (VEC). With a rated capacity of 305 kilowatts, this is the eighth largest solar electric installation in Wisconsin. It is also the state's first community solar project. 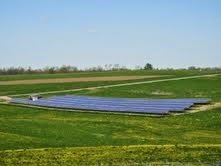 These new arrays raise the total amount of operating solar generating capacity in Wisconsin to 16 MW. The individuals standing inside the 517 kilowatt array serving Dairyland Power Cooperative are Dave Maxwell, VEC's Marketing & Communications Director, Joe McDonald, VEC's CEO & General Manager, and Holly O'Higgins, Energy Analyst, Wisconsin State Energy Office.